Stained the bath a little but nothing much to worry about! I loved this product, i personally think that bath bombs are one of the 'boring' products that lush offers as it doesnt really do much except fizz up and leave your water a nice colour! But this product smells gorgeous - really fruity, left my skin feeling really smooth afterwards and the smell lingered on my skin which i loved! It wasnt a overpowering scent either which is a bonus! Would i buy it again: Absolutely! 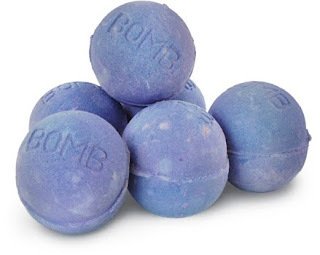 I havent tried many of the other lush bath bombs so i would probably purchase those first and work my around the others to see if there are any others i love! I think its a really good price for £2.56 and leaves you nice and relaxed after a long day! I picked up some other lush products recently so i will shortly be doing a collective haul soon and hopefully more reviews if you find them helpful? let me know! hey ... great review ... i love lush stuff ... my favourite stuff are the bubble bars ... especially the Candy cane one ... also the new one out for christmas the Christmas Eve one smells delicious! Also i would really recommend the massage bars they smell lovely and leave my skin so soft!! this makes me miss having a bath all the more!! showers just do not compare to a long soak in the tub :( it does sound like it smells amazinggg though!